The meeting stiles have been designed to withstand high wind loads, and equally important the lock stile has enough body strength to carry the lock and not flex excessively while opening and closing the door. 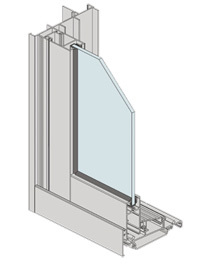 Two heavy duty sill options – One for standard water performance (150Pa) and a tall sump type sill for high water performance (300Pa). Low line nursing home sill option also available. Fly doors slide on the outside and run on large diameter wheels that have been matched to the track for silent running. Our screen doors have snap fit trailing stile interlocker that picks up the built-in screen door interlock on the fixed glass door stile, as shown on back page. Fixed panel external meeting stile has built-in interlock to accept the fly door interlock no unsightly rivets. The glass door and fly door rolling tracks are protected from accidental damage by the splayed threshold. Door panels can be glazed with thick or insulating glass units up to 20mm. Full range of door to window couplers allow this door to be joined to any Vantage window. Double weatherpile sealed door panels for maximum air and water exclusion. Sill drain holes are covered with co-extruded Santopene hinge flap to reduce air and insect infiltration.